When people think of security cameras, they often imagine that they are complex and expensive pieces of equipment that require an intricate setup. But that is not the case. The latest security cameras for alarm systems are actually very easy to use, affordable and incredibly simple. When looking for security camera for an apartment, there are a few things to consider. Most apartment residents are not able to drill holes in their walls. So having an easy-to-use camera that can be placed on a desk or table is usually ideal. It is also important that the camera has good night vision so that it can capture clear video even the lighting isn't the best. Finally, most apartment residents won't need to spend the extra money on a camera suitable for outdoor use. Instead, an indoor camera will work just fine. 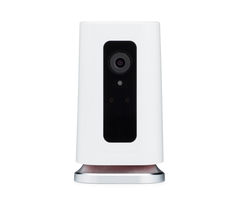 In summary, the requirements are a free-standing camera with night vision that works best in an indoor environment. So with that in mind, there are a few different camera models we can recommend. The decision of which camera to get typically comes down to whether a user has access to Total Connect 2.0 or Alarm.com. 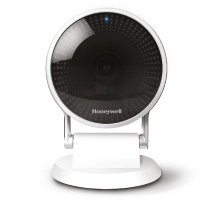 Total Connect 2.0 is used with Honeywell Systems, and Alarm.com is used with systems from other manufacturers, such as 2GIG and Qolsys. The service that they connect with will ultimately determine which camera they use. Keep in mind that most security systems do not allow users to view the feed of their cameras right from the panel. Instead, this must be done from the interactive service platform. Simply put, if a user has Total Connect, they will need a Total Connect Camera. And if they have Alarm.com, they will need an Alarm.com Camera. For Total Connect users, there are two viable options available. These are the Lyric C1 and the Lyric C2 Cameras. The Lyric C2 is a little more robust than the Lyric C1, but both are outstanding cameras for use in an apartment. 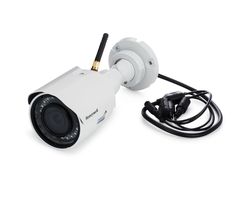 The Lyric C1 features 720p recording quality, a 135 degree viewing angle and an IR night vision range of 16.5 feet. It can be mounted on a desk or a table for easy access. This is the perfect camera for any TC2 user who wants a basic recording option for their apartment. As for the Lyric C2, it offers a superior, high-definition 1080p recording quality. And some users will prefer its rounder design. Its IR night vision range is also double that of the Lyric C2, coming in at an impressive 33 feet. Both the Lyric C1 and C2 can be easily integrated with a user's Total Connect account by having the camera scan a QR code that is produced by the Total Connect Mobile App. From there, the user can connect the camera to their local WIFI network. This makes both devices excellent for DIY users who are setting up their own system. A user should choose the C2 over the C1 if they require a more-advanced camera with greater recording capabilities. Meanwhile, Alarm.com users will have to use a different set of cameras. For apartment residents, we definitely recommend the Alarm.com ADC-V522IR. This is the best ADC-compatible that can rest comfortably on a desk or table. The device features a 1080p recording quality, an IR night vision range of 15 feet, and a 113 degree viewing angle. The camera connects to a 2.4 GHz or a 5 GHz WIFI network, and it can be learned-in with Alarm.com through a simple pairing process. Once a user has set the camera up, they can view its live feed from Alarm.com at any time. Overall, it is the perfect camera for any Alarm.com user who lives an apartment.